Foam mattresses are more comfortable because there are no pressure points against the body to cause discomfort. Foam is available in comfort levels of soft, medium and firm, the choice is yours. For couples, foam gives each partner individual body support. In addition, foam doesn’t allow motion to transfer from one side of the bed to the other. If one partner is having a restless night, the other can still sleep undisturbed. Kingdom Mattress is able to make a mattress custom-cut to any size, shape, or thickness. Polyurethane: The most popular foam, is made from a by-product of the oil industry, polyurethane foam is available in a variety of densities (weights) and compressions (firmness). Each density of foam can be produced really soft, really firm or something in between. Memory Foam: It responds to heat and pressure to conform to the body’s natural curves and provides support to the areas that need it most, such as the neck, back and hips. This response minimizes pressure points and therefore decreases tossing and turning when sleeping. Latex: Made of 100% pure Latex foam rubber. 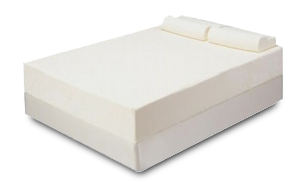 Latex foam is a very high quality natural product that is denser than polyurethane foam. Being natural, it is quite expensive, but will last a very long time.